Anirudh's World: Time to celebrate..
And to celebrate not one but two things. 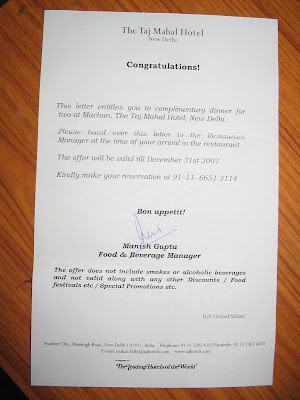 The first one being that Anirudh won us a meal for two at Machan, Taj Mahal Hotel. Yay! You may remember that on Oct 6, 2007 he had a fancy dress show at his play school. They had a raffle also along with it. But the draw was to be taken out yesterday i.e Oct 11, 2007. 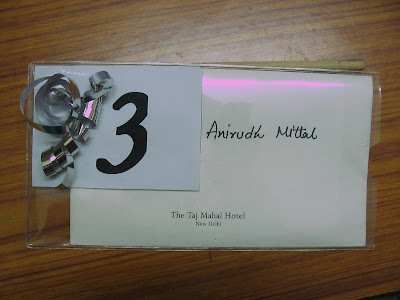 So when I had bought the raffle ticket, I wrote it out in Anirudh's name. And I completely forgot about the draw. But yesterday when I went to pick him up from the daycare, I got this lovely surprise! And the second reason for celebration, but that reason is only for me, because I realised that this is the 100th post on this blog! A 100th! 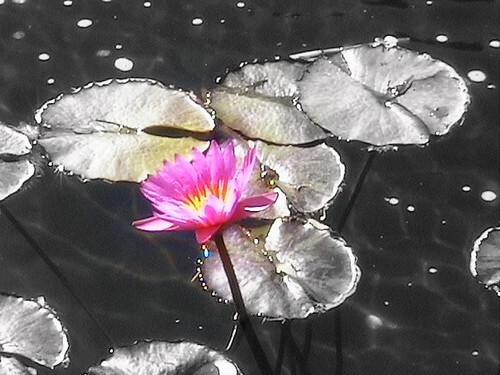 Its a 'Wow!' thing for me! Wow! That's Wonderful! Do take a picture to put in here later. Really!! Congratulations - hmm...come back and tell us all about the dinner. How many of us get to win something for our parents - that too at such a young age? I agree with his dadi. And congratulations yet again on the 100th!! congrats anirudh and nm :) let us know how the dinner was. and congrats on your century. looking forward to reading more posts on your blog! Congrats Anirudh and NM! He is such a luck boy (Touch wood)!His Dadi must have been so proud :) and Congrats on your 100th post! PG: Will definitely do that when we go! Usha : Thanks! I haven't seen that movie. I'm sure it won't be available easy at the DVD rentals but will try to download it from the net. Alapana: Wow! You made me so happy! And I was like :O when I read that you read the ENTIRE blog! Who wouldn't want a reader like that. :D Thanks girl! You made me so happy! Congratulations !! Here's to the next 100, what an apt gift Anirudh's gotten you folks. Amazing ! Double congratulations NM :-) And loved the last post too - sooooo cute ! Congratulations!!! Lucky lucky girl. Have a wonderful meal and come back and give us some mouth watering details. And keep writing :). Here's to the next 100. Hurray! what a lovely school you've put Anirudh in! Hope you guys had fun. and congrats nm for a quick century :) hope to see many more from you! achha, the jawahar nagar thing is too much of a coincidence! am going to be there on diwali, are you?